Bartender Jeff Terry is taking over the Boiler Lounge at Bit House Saloon Monday January 28 from 7p-Midnight. Jeff is competing in Bacardi Legacy, a cocktail competition that features 24 bartenders around the US for a chance to win one of two spots to represent the US in the international finals. 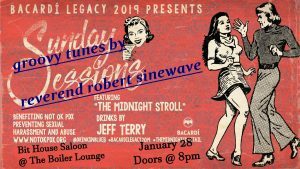 Jeff will be serving up his Bacardi Legacy Cocktail, The Midnight Stroll with the proceeds going to Not OK PDX, a local nonprofit that provides training and education to the hospitality industry to intervene and prevent sexual harassment and abuse. Music will be provided by Reverend Robert Sinewave.